Carbon Sink sculpture at University of Wyoming: Mining and energy donors have artwork destroyed. Academic and artistic freedom, Wyoming-style. Still from film produced by Ali Grossman. We’ve got a lot of dead trees in the Rockies. More than usual. As the region has warmed, bark beetle populations have exploded, and they’ve been killing off massive swaths of pine and spruce. It’s hard to miss the damage, and when British landscape artist Chris Drury visited the University of Wyoming campus in Laramie, he proposed to tell the forests’ story in an outdoor sculpture. “Carbon Sink: What Goes Around Comes Around” was installed on the U.W. campus in late 2011. Funded by an anonymous donor and by the state Cultural Trust Fund, it consisted of a 36-foot-wide circle of logs from beetle-killed trees, arranged in a whirlpool pattern around a pile of coal. Drury hoped the sculpture would be left in place until it disintegrated, and the director of the campus art museum said there were “no plans to uninstall it.” It was, Drury said, intended to inspire a conversation. In May 2012, however, just after most students left campus, Carbon Sink quietly disappeared. When University of Wyoming graduate Joe Riis inquired about the fate of Carbon Sink, a university vice-president told him that it had been removed due to water damage. But emails recently obtained by Irina Zhorov, an enterprising reporter at Wyoming Public Media, tell a different story. After the university announced the installation of Carbon Sink, Marion Loomis, the president of the Wyoming Mining Association, wrote to a university official and asked: “What kind of crap is this?” Both industry representatives and state legislators weighed in on the sculpture, some threatening the university’s funding in no uncertain terms. In April, university president Tom Buchanan wrote to the director of the art museum: “Given the controversy that it has generated, it would be best for UW if the fire pit (I’ve forgotten the name of the work) could be considered part of the [removal of other campus artworks] during the summer of 2012.” It was, and today, no trace of it remains. Buchanan and others have tried to walk back their statements, here and here. But since the installation of Carbon Sink, the Wyoming legislature has passed legislation requiring that art on parts of the university campus must be approved by the state governor and the U.W. School of Energy Resources governing board. Public art is notoriously controversial. But controversy, in a way, is its very purpose. As Drury suggested, memorials and murals and outdoor sculptures—even, say, creepy 32-foot-high electric-blue horses—are meant to start conversations, even if the conversation is sometimes about how awful they are. A campus- or city-wide conversation without at least a little controversy is clearly leaving somebody out. In the case of Carbon Sink, the conversation barely got started—and almost everyone was left out. Courtesy of Indiana University Archives. Could it have been handled any better? 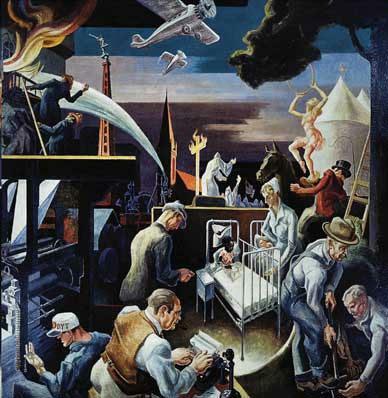 Consider the case of Thomas Hart Benton’s Indiana murals, which have been displayed at Indiana University in Bloomington since 1940. The 22 panels tell the history of the state, from the Mound Builders to the early 1900s, and they include the bad and the good, for instance placing members of the Ku Klux Klan—which briefly dominated state politics in 1924—in the same panel as a reporter and a printer from the Indianapolis Times, which broke the Klan’s hold on the state (and won a Pulitzer Prize) through its dogged coverage of KKK corruption. The Klan panel has long been controversial, discomfiting first white viewers and then, when it was displayed on the I.U. campus, drawing complaints from the Black Student Union. In 2002, the union asked that the panel be covered. Public universities have restricted or removed art deemed obscene or offensive, and a string of legal cases has pondered the exact meaning of those adjectives. But both Carbon Sink and the Klan panel seem well clear of this territory, and while their stories are unpleasant and inconvenient, they’re built with facts. What follows, then, is my own deeply felt position, respectfully developed after careful listening and much reflection. I am convinced that moving or covering the mural would be morally wrong, because it would, in effect, do what Benton refused to do: that is, it would hide the shameful aspects of Indiana’s past. I might note that trying to move the mural would probably damage it, perhaps destroy it, but the major issue here is a moral one, not one of cost or even of preservation. I am also convinced that the major issue running throughout all of the discussions and conversations over these last several weeks is not, in fact, the Benton mural, but is instead the status of diversity on our campus. The real issue, the real test of character, for Indiana University Bloomington is the strength of its commitment to diversity. The chancellor then proposed an education program around the murals that would provide historical context to all students encountering them. She also proposed several significant diversity initiatives, including a fundraising campaign for more multicultural art on campus: “Let’s put IUB on the artistic map as a center for vigorous, exciting and (yes) controversial art by the multicultural artists of today,” she said. Brehm resigned a few months later to take another position on campus, but multicultural programs have expanded, and active and public examination of the Benton murals has continued. These cases aren’t identical, of course. An angry university funder is harder to defy than an angry student group, especially if the funder is the coal industry and the university is in Wyoming. But the University of Wyoming, like most public universities, has a mission statement that calls for academic freedom and free expression. University donors are supposed to further that mission, not try to restrict it, and university leaders are supposed to defend it. What if President Buchanan had given a speech like Chancellor Brehm’s? He could have acknowledged the reaction to Carbon Sink (taking care to first learn its name), and acknowledged the economic and political power of the coal industry in Wyoming. He could have acknowledged the science—some conducted at his own university—that demonstrates the connections between coal power and climate change, and climate change and forest decline. And he could have said that while coal is useful and important, it’s equally important to not only acknowledge its costs but also work to reduce them. He could have pointed to existing university programs aimed at doing just that, and called on the legislature—and the industry—to fund more. It wouldn’t have ended the controversy. But it might have opened the conversation.